We must have all experienced stigma at one time or another, but for most of us it’s a passing irritation to be batted aside with a swift putdown. Our cover story – and much of the rest of the magazine this month – is a reminder that for many it’s not so easy, and that we should stand up for our client group. We must fight for the survival of NHS addiction services, Clare Gerada told GPs at their recent Cardiff conference (page 10), while in this month’s Soapbox (page 23), Ken Stringer warns that some parts of our treatment system are simply unravelling. It’s not going to get easier for a much-maligned client group in the near future. But there are areas of progress that should help motivate. A pilot project with London hostels has helped residents discover their strengths and escape ‘revolving door syndrome’ (page 18), while peer support initiatives in Bristol are giving positive outcomes to older drug users. The effects of people power cannot be underestimated as Alistair Sinclair reports from a Lancashire recovery event (page 16) – a powerful demonstration that the negative experiences of stigma we heard on page 9 can be transformed with the right peer support and professional empathy. Public health minister Anne Milton acknowledges in News Focus (page 6) that payment by results is not just about the money. Let’s hope her colleagues believe her. How will the sector adapt to payment by results? DDN reports from a recent learning event for treatment providers. Tackling stigma is no longer about ‘us and them’ but a shared opportunity to further the goals of substance misuse treatment and recovery, according to Nottingham service users. Amid speculation about tightening budgets and structural change, the message that treatment and recovery must be at the patient’s own pace came over strongly at this year’s GPs’ conference. Older drug users are likely to respond very well in group settings when surrounded by their peers, says Rachel Ayres. A key figure in shaping Obama’s drug policy, Keith Humphreys is now working with the coalition government. He talks to David Gilliver about politics and polarisation. 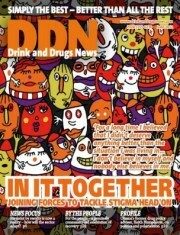 A project in London hostels has been helping to motivate both residents and staff, as DDN reports. Alistair Sinclair reports from a genuinely community-led celebration of recovery. Chaotic and unregulated drug services are not the solution for stable clients, says Ken Stringer.